Recent volatility has many investors spooked. But dividend-growth stocks can help. Over time, solid dividend-growth stocks are almost always less volatile than the overall market. We show how less volatile stocks can increase your chances of retirement success. Volatility has returned to the markets in a big way. We couldn’t avoid it forever, of course. But the way volatility came on so suddenly was surprising to many market observers. In the span of one week in late January through early February, the VIX, which measures the market's expectation of market volatility for the S&P 500, jumped from 11 to over 37, a 236% increase. During the market downturn and increased volatility earlier this month, not much was spared. U.S stocks, bonds, international stocks, and commodities all fell. This was a serious problem for those who thought being diversified would help shield them from such downturns. The S&P 500 fell by 10.1% during the downturn. But what about stocks that should be less volatile? I often discuss how solid dividend growth stocks are generally less volatile than the overall market. One of my favorite ETFs that contains several of these types of stocks is the Vanguard Consumer Staples Fund (VDC). During the latest stock market downturn, this ETF fell by 8.6% compared to 10.1% for the S&P 500. What About Individual Dividend Payers? Two of the three stocks I hold did better than the S&P 500, but Johnson & Johnson performed worse. Of course this is somewhat anecdotal evidence. A better sample size is what happened during the financial meltdown of 2008 and 2009. If a company pays out relatively stable and growing dividends over time, then mathematically its returns should be less volatile. This has actually been shown to be the case in this research piece. I now want to show how less volatile dividend payers can make your retirement portfolio more stable and give it higher odds for success. I first ran a scenario where 80% of my retirement money is in stocks and 20% is in bonds. All of my stocks are invested in the S&P 500 index. The S&P 500 has seen volatility (its standard deviation) of about 16% over the past ten years. I ran this retirement plan for a 42 year old couple that has $350,000 in investment assets. I assumed retirement expenses of $52,000 a year. 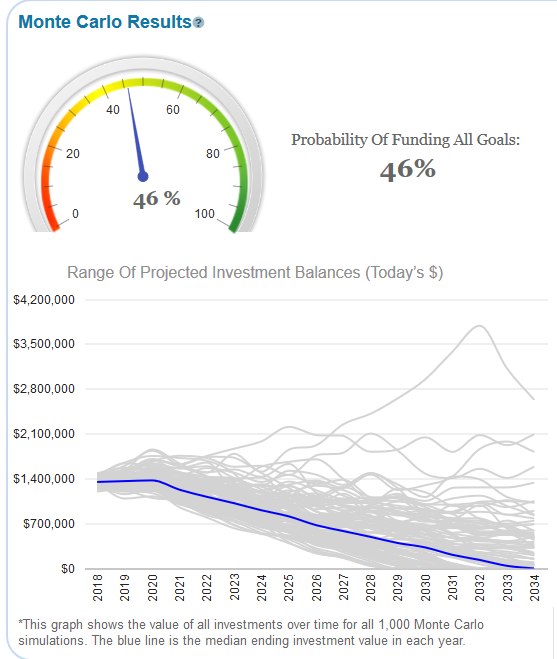 When I ran this through our Monte Carlo simulation I found that their odds of retirement success (never running out of money) was only 46%. This is over a 20 percentage point jump in our probability of plan success. Volatility plays a larger role in retirement success than most people think and this is a great example of it. 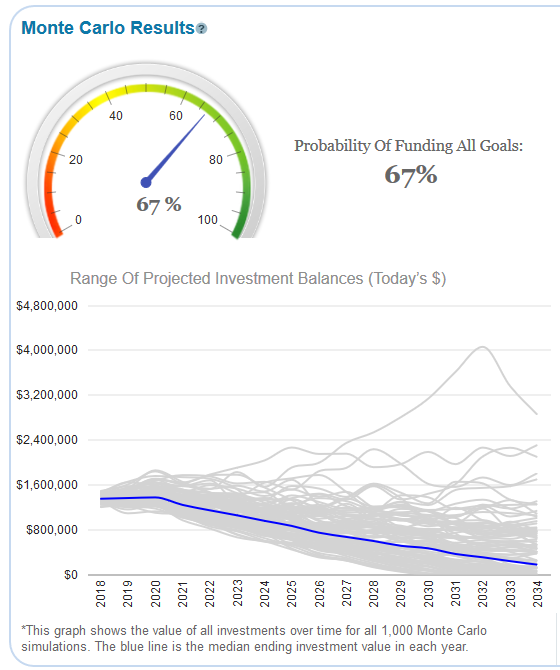 Monte Carlo analysis is a great way to tease out portfolio risk. It is also a good way to show how solid dividend payers can lower your overall risk and increase your chances of retirement success in the long run. Disclosure: I am/we are long JNK, PG,MO. I wrote this article myself, and it expresses my own opinions. I am not receiving compensation for it (other than from Seeking Alpha). I have no business relationship with any company whose stock is mentioned in this article.